Fine Cartier Art Deco silver, gold, enamel and hardstone boudoir antique clock. 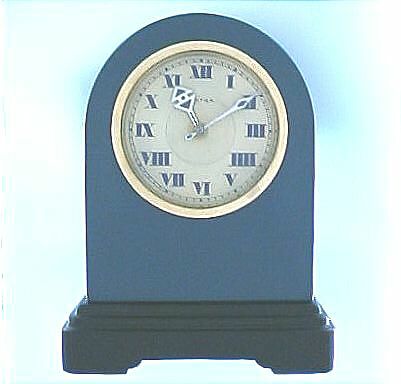 The body of the clock of dark blue enamel over silver (with typical minor scratches), mounted on a black hardstone base. Gold bezel, gilt dial signed Cartier with bold numerals and fancy gold hands. Eight-day jeweled lever platform movement signed "European Watch & Clock Co." A very attractive classic little clock.